I've made a lot of changes in my life in the last two years of studying naturopathy and I continue to make new changes as I read and understand more. One of the difficulties I encounter is translating what I'm learning to my three-year-old and five-year-old and getting them on board with eating nutritious whole foods instead of all the processed food and sugar they see all around them. I'm not a food Nazi, I do let them enjoy some things I would rather they didn't eat, but I try to teach them as we go that certain foods are good for our bodies and should be eaten often, while other foods taste great, but are actually harmful especially in large quantities. I try to make nutrition a positive thing, that mommy wants them to be very healthy so they can do whatever they want in life and not be hindered by weight, disease, lack of energy, etc. It's a lot for young kids to take in, but they are doing a great job. It seems almost daily they want to know as they eat something "is this good for my body?" It's cute, precious, and encouraging to hear them asking. Of course, it doesn't always stop them from eating the bad stuff, but at least they are asking. 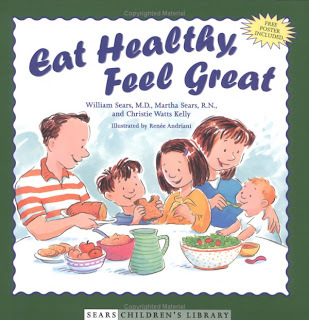 Recently, two friends at different times recommended a great book to use with my kids to help as we talk about nutrition. It's called Eat Healthy, Feel Great by William Sear, M.D., Martha Sears, R.N., and Christie Watts Kelly. I love this book and am looking forward to reading it to the kids over and over. It talks about why we need to eat well and then breaks food down into three groups. There are Green Light foods, green means go and you can go ahead and eat all you want. Then there are Yellow Light foods which are okay to eat sometimes, but they won't keep you feeling great the way green light foods do. Then there are Red Light foods that don't do anything to help your body. Instead, they can hurt your body and make you feel too full to eat your green-light foods. These are foods that contain dye, hydrogenated oils, preservatives, white flour, and sugar. The book goes on to describe nutrients, vitamins, a few minerals, fiber, and even water. They stress picking a variety of colors when eating fruits and vegetables. The book closes with a smoothie recipe that kids can help make and a cute idea to make a whole grain cereal and dried fruit necklace. It's really a great resource with fun pictures and language that is brought down to the child's level. From now on around our house, we are going to talk about food as red, yellow, or green light and I hope it will be easier for them to understand. Model wise nutritional choices. Refuse to purchase junk food or to bring it home. If it's not there, in moments of craving, you and your children will choose a healthier alternative. Shape young tastes. You have a golden opportunity to influence your child's lifelong eating habits, and the earlier you start, the easier it will be. If freshly prepared, unsalted, unsweetened foods are the norm in your household; your child will shun canned, artificial tastes. Don't shy away from spending more money on nutritious foods for your family – whole-grain crackers and breads, no-sugar added 100 percent fruit juices, and organically grown produce. Your pocketbook will thank you the long run with lower doctor bills. Use creative language when denying your child junk food. The words "not a grow food" or "not a green-light food" are easier for a child to swallow than "no." I know some may wonder what the fuss is all about. I've heard people say they are just kids and it will be years before they need to watch what they eat. I disagree. If you build a house with substandard materials you end up with all kinds of trouble and trying to fix it when trouble begins. Isn't that what we are doing when we eat, building our bodies and the quality of what we eat influences how our bodies will respond over time. How much more important when we think about children who are doing the most growing and changing. Each new muscle, bone, nerve and brain cell needs the best nutrients for them to be the best they can be. Don't forget to enter our first ever giveaway before midnight on Monday! You will love the glass straws! I completely agree with you - it's never too early to teach your children to eat healthily. That way they are protected from the diseases that are so rampant among young people these days and will grow into healthy adults with ingrained good habits. I really like the red light, amber light and green light concept! My 4 year old son actually says the words "grandma I can't have that cereal because it has high fructose corn syrup in it." How proud am I!!! Thanks for the heads up on the book. I'll be checking that out. And it's true, kids eat what they are used to and what they learn when they are young. My son has food allergies and recently outgrew his milk allergy. He can now have regular sized Hershey bars. He's not interested. He's never had anything like that so he doesn't have a taste for it. His Grandma offered him one and he said "No thanks, I'd rather have a banana". Thanks for the tip on the book Daedra. It is great when your kids know to say no to certain foods. It makes you feel like all of your teaching is getting through. Hello ChupieandJ'smama! Thanks for commenting! I have a similar story. An unnamed source bought my kids a box of Hostess cupcakes and they tried a bite of one and then dismissed the whole box. Later I asked them why they didn't eat them and L. (5 year old) told me they tasted fake. Yes! I agree with you on all counts. It frustrates me so much when family or friends, or total strangers, regard me as an oppressive parent because I don't feed my child junk. I don't see why it's necessary to a happy childhood to eat cookies every day. Seems to me, that would make for a an unhappy childhood, given the sugar spikes and weight issues that would cause. BTW, it was recommended to me by a nutritionist to read the book Child of Mine by Ellyn Satter. Although I haven't read the Sears book, that sounds infinitely better than the Satter book. Thanks for the recommendation! Hello Healthy & Green! I'm so glad you enjoyed the post! Let me know if you recommend the other book. I'm always in for another good read!